Langston James ‘Kimo’ Goree VI, Director of IISD Reporting Services, has a ringside seat at high-level environmental negotiations. IISD’s Earth Negotiations Bulletin is an essential read for government officials, policy makers, environmental groups and journalists. Here Kimo talks to Tim Williams about transparency, marginalised voices and staying ahead of the media and communications curve. How did the International Institute for Sustainable Development (iisd) Reporting Services come into being? Absolutely by accident. As one of the NGO leaders in the preparations for [The United Nations Conference on Environment and Development (UNCED), also known as the Earth Summit] Rio in 1992, I was involved as one of the strategic planning session moderators with the NGOs. There we wanted to come up with a report of what was happening at the negotiations. So that someone could walk into the NGO strategy session and know what was going on – allowing us to get straight in to talking about strategy and not about information gathering. 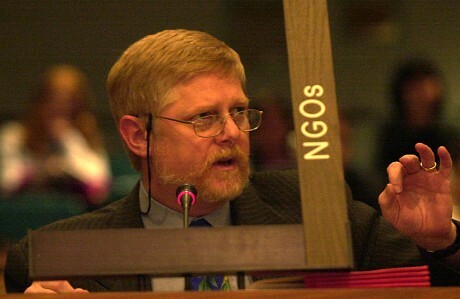 We published our first summary of the first week of the negotiations of the third PrepCom for the Rio Process in August of 1991 and it was immediately picked up – not just by NGOs but by governments, who faxed our little report on the first week of negotiations back to capitals and told us that they wanted us to prepare the next week’s summary. It was really by accident that we discovered that the information that we were putting together was of use to governments. We published the Earth Negotiations Bulletin for the very first time 20 years ago, in March 1992, and we haven’t looked back since. We’ve grown from three people sitting at the back of negotiation rooms with Toshiba laptops trying to provide some transparency – to now a $4m-a-year operation publishing the Earth Negotiations Bulletin and other reports from about 75 UN meetings each year and doing knowledge management products and systems on a whole range of other issues. What was the media scene like at Rio in 1992? Of course, hardly anyone was using email. Nobody was using the internet – because it hadn’t been invented yet. We were publishing about 4,000 copies a day at Rio and distributing them in English and that was about the best you could do in those days. What we have seen is that by staying out in front of the communication technologies of the time and by blending good communication technology with good content we have developed products that have served policy makers with the right format for them. In 1993 we started a listserve, which was a brand new idea then. In 1994 we developed a website – before anyone had a website in 1995. In 1994 we started distributing material in PDF format before anyone had Adobe Acrobat Reader, and we started streaming audio and video and creating larger community listserves. As the communication ecology has changed with new technologies coming online we have always been out front and always blending those new technologies with the good, old-standard, neutral, timely and authoritative information that people want. What new technologies are going to be key for these negotiations and policy makers in the future? As they say in Canada, you don’t pass the puck to where the player is – you pass the puck to where the player is going to be. So right now we are building new ways to disseminate our information where we think people are going to be in the next two to three years. We are developing an i-phone, i-pad and Android application for Rio +20. We’ll be launching it in March and we are hoping that at Rio everyone is walking around with this app on their hand held device. We are also using the new web 3.0 semantically-aware tagging and coding of our data [Read more about the Semantic Web on Wikipedia]- anticipating that in the future databases are going to be talking to each other, using linked open data and persistent universal resource locators, so that people will be accessing data in new and different ways that require databases to be created that way. The other thing that we are really looking at right now is how we can use some of the predictive tools available that mine social data, using things like Hunchworks or Global Pulse as it has been developed in the Secretary General’s office in order to stay ahead of disasters and adaptation crises. It’s not something that we might do – but at least we will be able to inform our readers and have other organisations use these technologies. How can you get relevant, marginalised voices to the table at high level UN conferences? I don’t know that that’s my responsibility. We are working as knowledge brokers and knowledge providers to a real niche. We are providing policy makers with real time information on what is happening in policy implementation and practice. There’s a role for other people in this ecosystem to take the information that we have and communicating it out at appropriate levels using appropriate technologies at grassroots, community and regional levels. But it’s a large information eco-system with everybody playing their own part and we play our role at this level. In terms of bringing information from those levels – that ground truthing – I think it’s the obligation of any organisation to rotate their people out of positions where they are sitting in desks in developed country capitals and getting them out into the field so they can see how their policies actually roll out at the grassroots level. The International Institute for Sustainable Development – Reporting Services Division – provides multimedia information resources for environment and sustainable development policymakers, including daily coverage of international negotiations, analyses and photos. IISD is the publisher of the Earth Negotiations Bulletin, which along with other IISD products are used by government officials, policy and decision makers, UN staff, non-governmental organizations, intergovernmental organizations, business, industry and academia.